6. Will We Dream About the Ball? 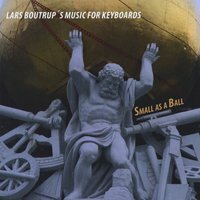 Small as a Ball contains 8 new instrumental compositions written by Lars Boutrup in the style of classic keyboard driven prog rock. Themes, synth and rock organ explosions along with dreaming keyboard playing make Small as a Ball a unique album you want to play again and again. Small as a Ball is mixed with the steady rhythm duo of drums and bass of Fredrik Sunesen and Niels W. Knudsen. Like its predecessor ”The Symphonic Dream” Boutrup, Sunesen & Knudsen have added a great live feel on Small as a Ball, with energy, punch and soul. On every note it´s beautiful it´s nasty and it´s clear that the boys love to play that kind of instrumental music to get their spirits high.